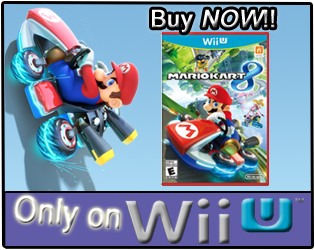 Wii Party was released on October 3 this year, with a MSRP of $49.99. 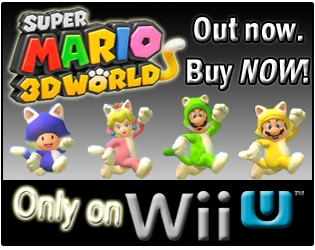 It was developed by Nd Cube and Nintendo EAD, and published by Nintendo. Wii Party was rated "E" for "Everyone" by the ESRB, and the only "Content" listed for parents to be aware of is "Mild Cartoon Violence". We last looked at Wii Party's game-play hours on November 4, as they had debuted on the Wii's Nintendo Channel on November 1. 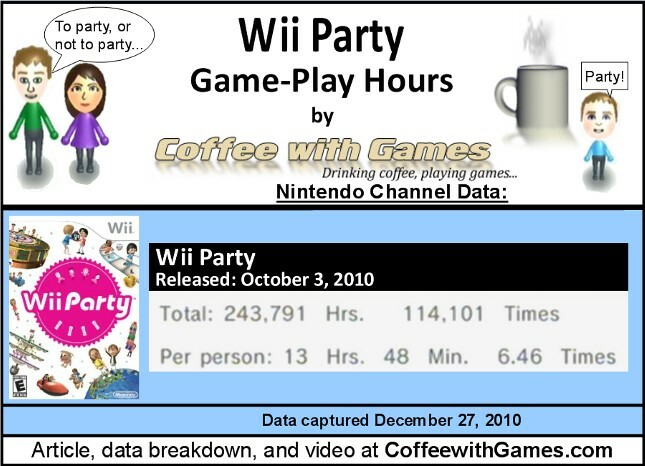 How many hours have gamers reported partying with Wii Party since the data reported on November 1? Let's take a look! Wii Party now has 17,662 Wii owners reporting their game-play hours through the Wii's Nintendo Channel. Wii Party has seen an increase of about 12,187 gamers reporting play-time data, since the game-play data recorded on November 1. Wii Party now has 243,791 Total Hours of game-play reported, an increase of 189,745 Total Hours since the last report. 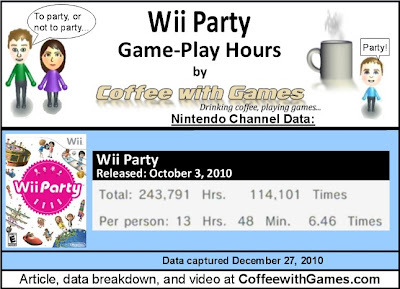 The average play-time for Wii Party is now 13 Hours 48 Minutes "Per person"(or console) reporting data, an increase of 3 Hours 55 Minutes on the average reported "Per person". The average play-time per session for Wii Party is now just over 2 Hours 8 Minutes. Wii Party's Amazon.com sale rank is currently #74, and is selling for $44.99. Sale rank and advertised price recorded on December 30, 2010 around 9:45PM. Wii Party's review score average is now 71.78%, based on 23 "professional" reviews on GameRankings.com. Wii Party still has a 4 out of 5 Stars rating on Amazon.com, and now the rating is based on 86 customer reviews, an increase of 63 customer reviews since the first report. Review score averages recorded on December 30, 2010 around 9:45PM. To party, or not to party? That is the question! I still haven't played Wii Party, but if we were to get the game, our son would probably love playing the "hide-and-seek" game...with him hiding the Wii remotes and us never finding them. He just turned 20 months, and loves controllers and remotes, so as his Mii in the data picture said, he would say yes to "party". I think the reported game-play hours for Wii Party are good, but not great, especially for a Nintendo published Wii title. Wii Party is performing better compared to some other Nintendo published games, like Sin and Punishment: Star Successor, but with the word "Wii" in the title, I really expected the game to be performing better than it is. While we are just coming out of the holidays season, and perhaps Wii Party was under a lot of Christmas trees, seeing the game's sales rank out of Amazon.com's "Top 50" games overall, and not in the Wii's "Top 10" games ranked, is pretty surprising. Did any of you receive Wii Party for Christmas, or another holiday this year? If so, and you have had a chance to play it, what do you think about it? I'm really curious to see what others say about this. This is a game we have not yet gotten, but are interested in We enjoy the party games (Mario Part for the Wii still gets pretty good mileage around here) I've seen the scores vary quite a bit, with some high ones talking about hos varied and intuitive the games are, to others saying it's mario party without the mario. Love this game. There's enough variety for this to be seen as different from the MP series. A must-have for families. I haven't played a Mario Party game for more than 2 minutes that I can remember, but Mrs. CoffeewithGames and I have really enjoyed the Rayman Raving Rabbids games. Thanks for the feedback! If families could only afford one "party" type game, would you suggest Wii Party over Mario Party 8? Has anybody else been playing Wii Party lately? If so, what do you think of the game?